I’ve used torsion bar sway bars on a few of my builds in the past, and wanting to keep all of my suspension components matching, I went with Teraflex bars for the CJK8. 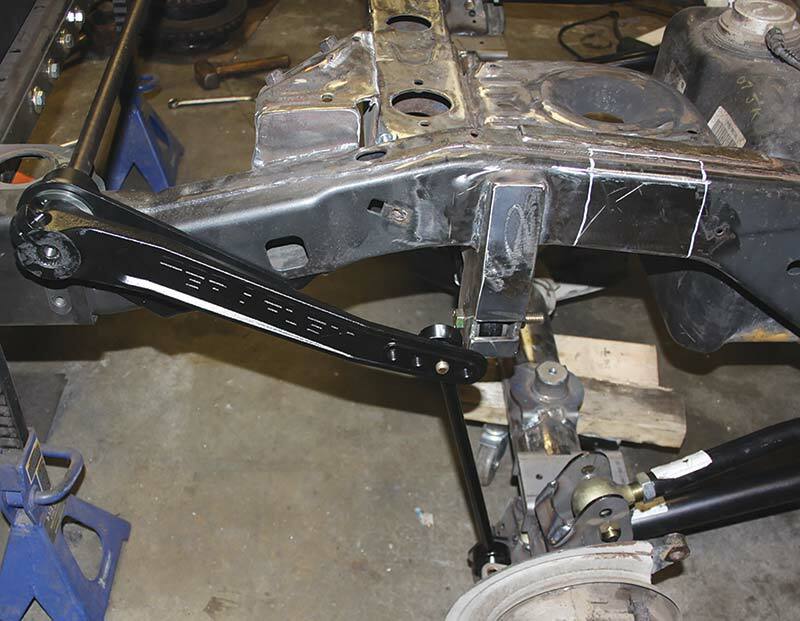 Teraflex actually expands on the “twistable”-style swaybars by offering three versions of their sway bars. 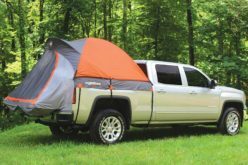 The Trail Rated, which is what I chose, has a single rate and is not disconnectable in any way. The centre bar twists with articulation, while providing side-hill stability, as the bar can’t bend in the middle. 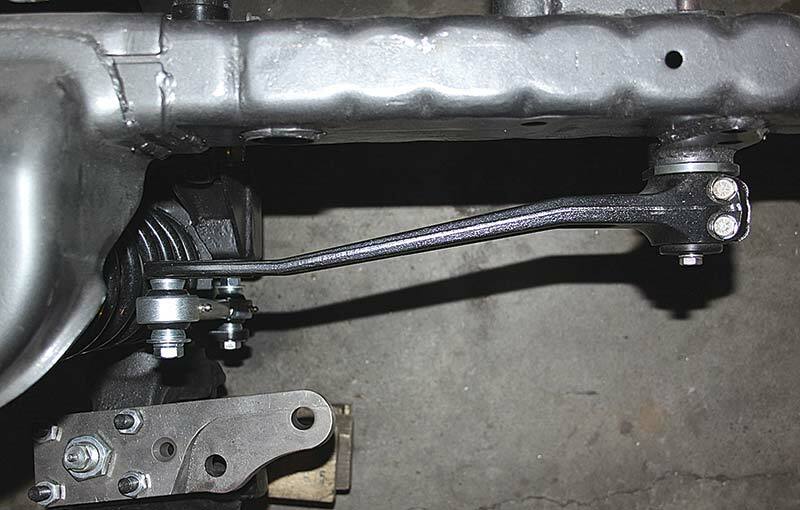 Typically, these types of sway bars offer better roll control, but are not as stiff as, say, a stock fixed sway bar. The next Teraflex swaybar is called the Single Rate. 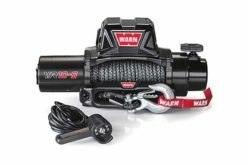 It has a stiffer rate for street and fully disconnects with a knob on the end for trail use, to get maximum articulation off-road when disconnected. 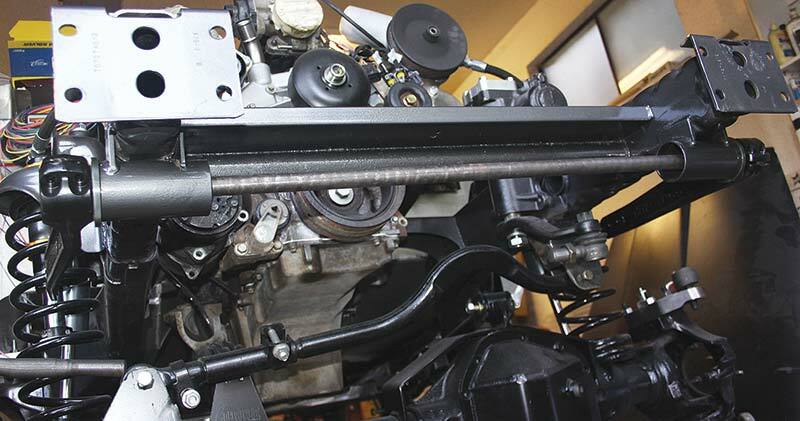 The third Teraflex swaybar is called the Dual Rate. 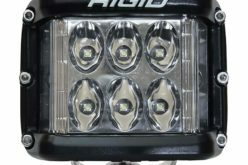 It offers both of the features of the first two. Stiff street bar, then the next stage a softer trail-rated bar, then fully disconnected for full off-road articulation. 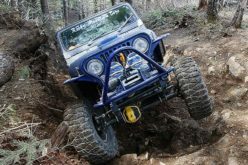 While having the disconnectable option would have given the CJK8 more suspension choices, as I am running very large tires and pushed the axle ahead two inches, I felt that the knob might get in the way of the tires. 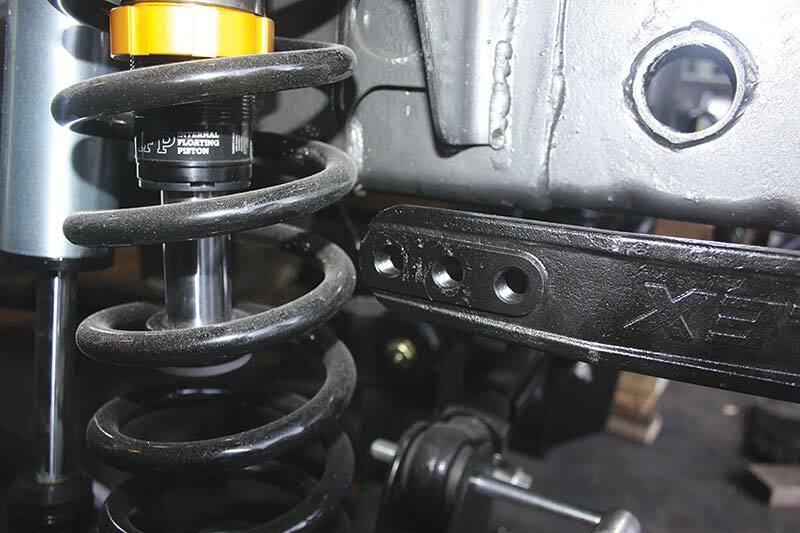 So, I stuck with a style I am used to and comfortable with, and along with that, I have triple-bypass Fox Shocks that are also adjustable, so plenty of suspension control already. The front Teraflex sway bars come in three flavours. The Trail Rated which is always connected (this is the bar I used). 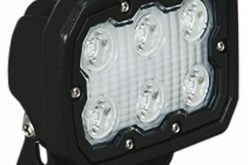 Single Rate middle, which is stiffer when connected and you can disconnect fully, and the Dual Rate, which is fully connected for best road manners, second stage like the Trail bar, and then fully disconnected. 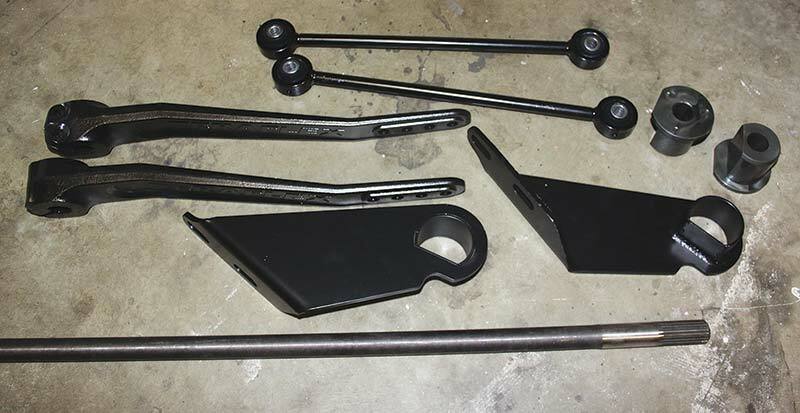 The brackets for the JK sway bars bolt inside the crash bar found on the front of the frame. In my case, the front differential is a Dana 60 with high steer arms. I needed to raise the sway bar as high as I could for clearance over the re-positioned steering. I still used the Teraflex brackets; however, I removed the entire crash bar replacing it with a stronger front crossmember. 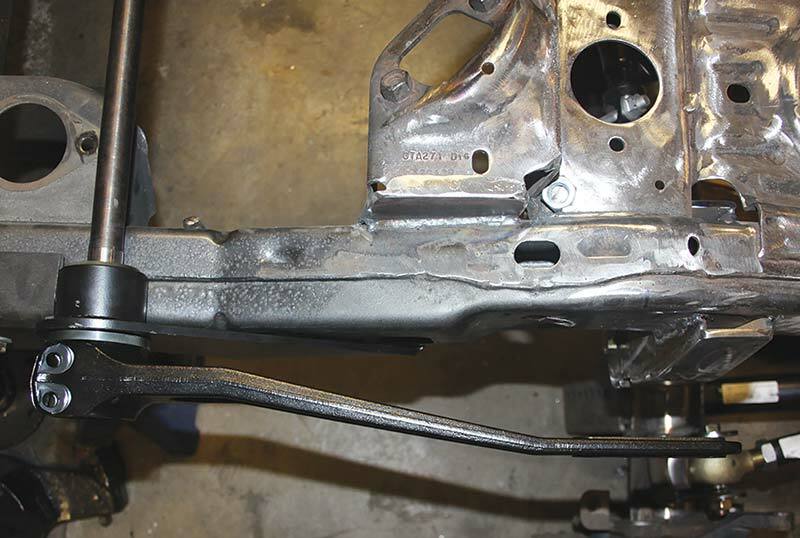 In this case, the Teraflex brackets are welded to the frame in place of the crash bar. 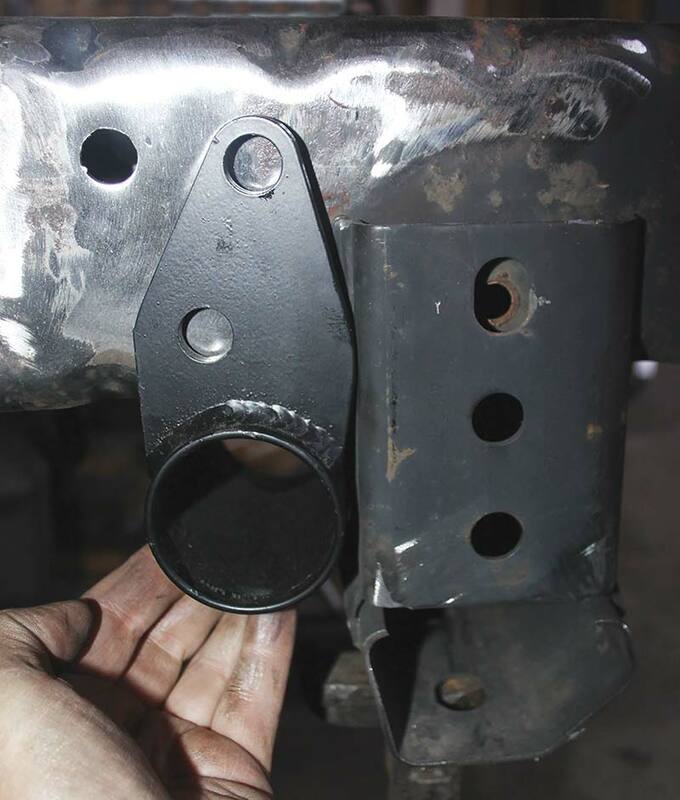 With the torsion bar inserted through the two brackets, the bushings are drifted into the brackets. 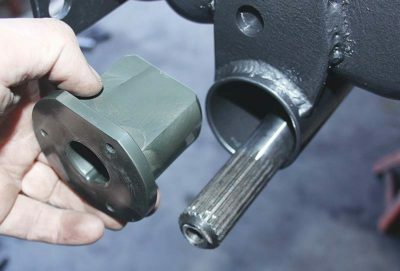 Note the flat side on the bushings… not for JK use, but they do come in handy for TJ applications, so it doesn’t matter their orientation in this case. … I needed to trim the ends of the arms and remove one of the link positions. Basically, the further you move the axle links up the arm, the stiffer the sway bar rate becomes, so any can be used. 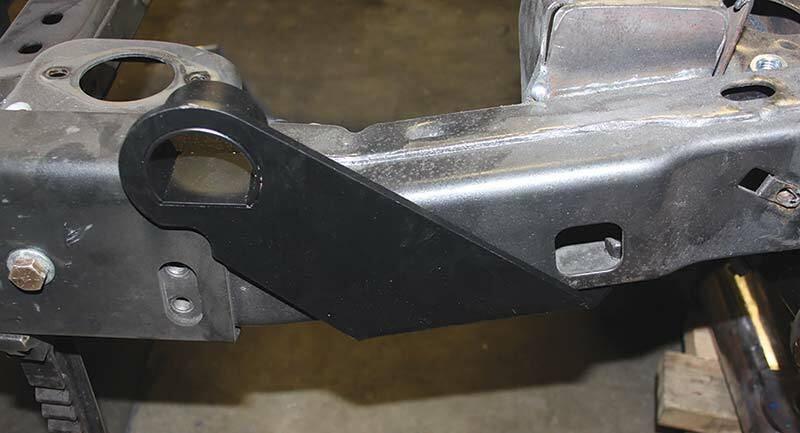 The torsion bar installed in the two brackets, less the crash bar. 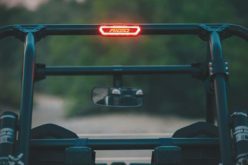 Keep in mind, the bar would be inside the stock crash bar and not visible if installed the designed way. 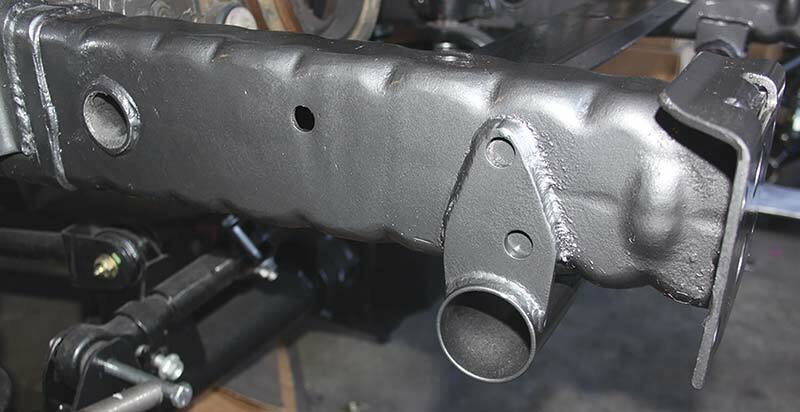 In place of the stock crash bar and the tubular crossmember in front of the engine, you can see my new boxed cross member for the grill and rad mounting, and below it is a piece of round tubing welded in as a stiffener. I found the fit of the arms extremely snug over the bars. I used a chisel to spread the bars slightly and they slid over the splines a lot easier this way. The front sway bar links are length-adjustable and can twist with suspension flex. Below the bar with links in place. The links are mounted to the outside of the sway bar arms, the top bolt threads into one of the three position holes, while the bottom installs with a bolt through the sway bar tab on the axle. 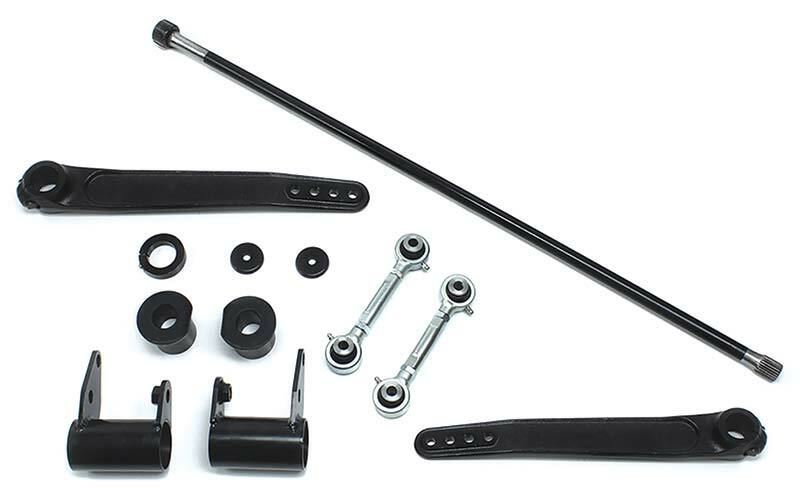 Unlike the three front options, the Teraflex rear sway bar only comes in one stiffness. 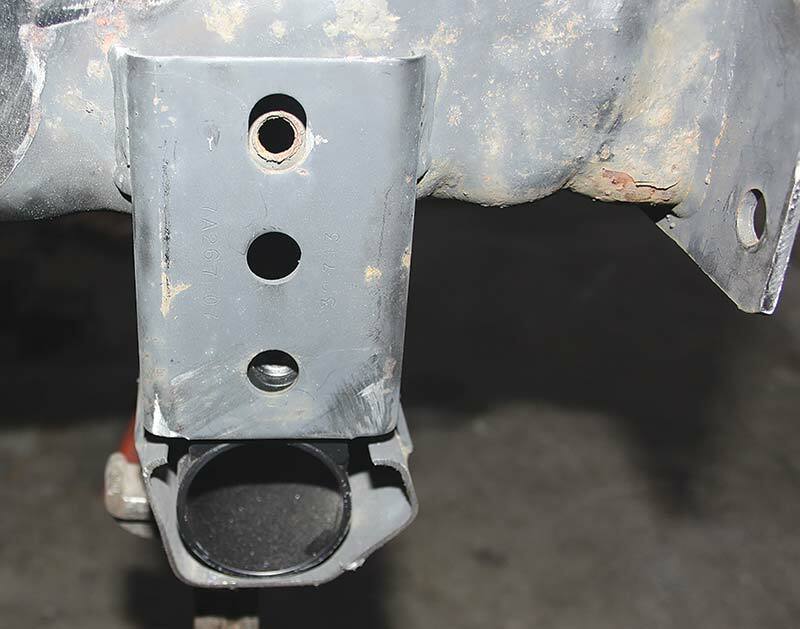 As you can see, it uses the same bushings in the front, but the bracket has a flat side on it for positioning. 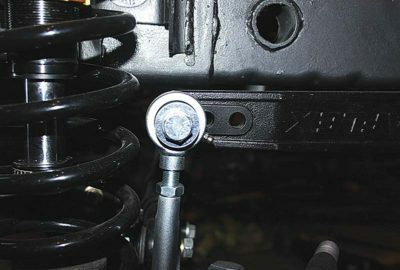 The same sway bar arms are used as in the front, but the links are a fixed length. 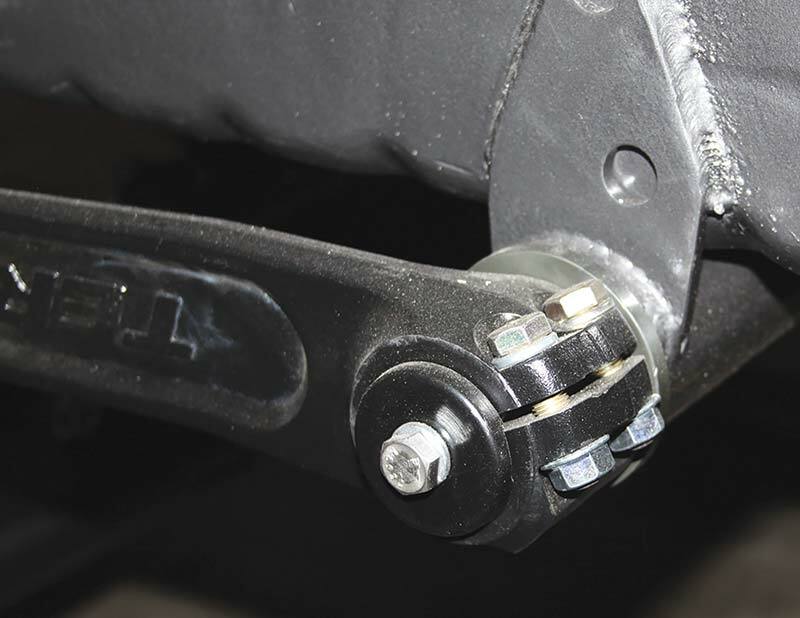 The sway bar mounting brackets bolt into the bottom of the frame using existing frame-threaded inserts, and the bar runs over the top of the frame. 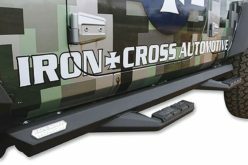 Even with the Warn rear bumper brackets in place, there was plenty of room for both components. After fitment, I chose to weld the Teraflex brackets to the frame. 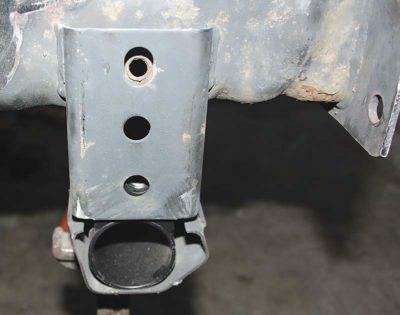 This isn’t necessary; it’s a nice tight fit between the bar resting on the top of the frame and the bolts though the bottom – just some peace of mind for me. 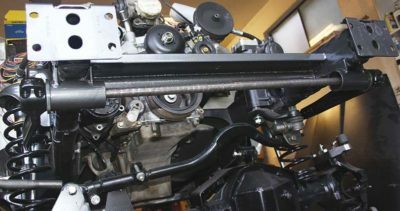 Below shows the torsion bar running across the top of the frame rails. Like the front, the arms are angled for clearance around stock frame brackets. 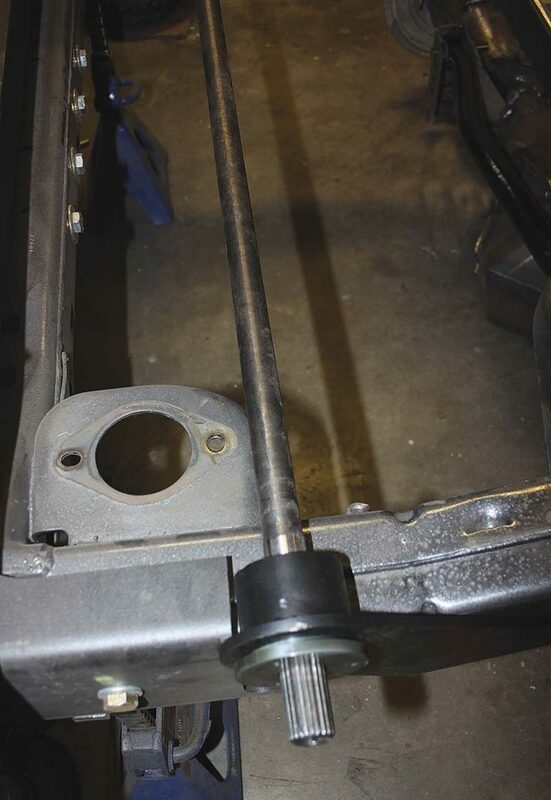 Two bolts go through the arm to clamp it onto the splined torsion bar. The bars are the same left and right; however, one peeve is that the cast-on Teraflex name ends up upside-down on one side. 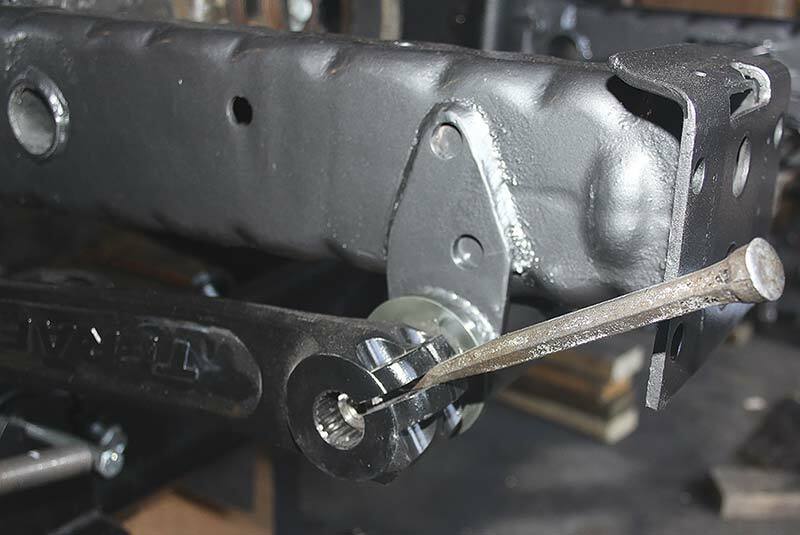 Once on the splines, the arm is clamped on with a pair of bolts, and an end cap makes everything look nice and clean. 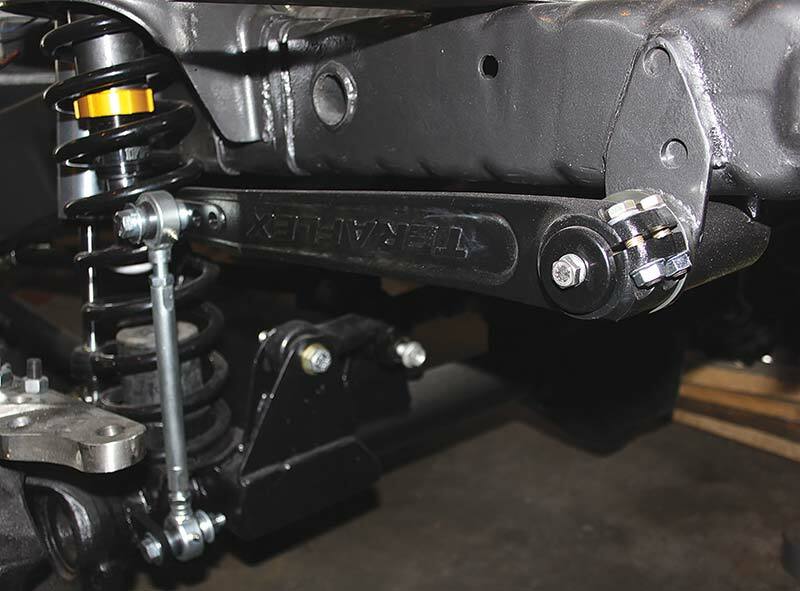 The rear sway bar is angled downward more, to allow for compression clearance of the body, though we are lacking the box on the CJK8 yet, so there will be a bit more weight back here to come. 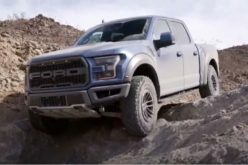 The arms have four positions to pick from for the end links – the shorter you make the connection, the stiffer the sway bar rate will become.